Axator Gear is a Bakugan Battle Gear and one of the pieces of Dragonoid Colossus. 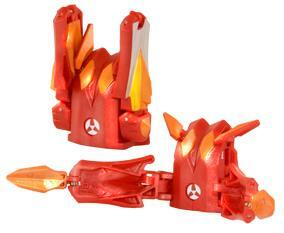 Axator Gear is a Bakugan Battle Gear launcher mounted on the front of Dragonoid Colossus. Its devastating attacks make his enemies shudder with fear. Unlike the other pieces, this one can only be put on after Dragonoid Colossus is completely opened, as it usually goes on the neck. It looks like a pair of blades. It's Silver and has 80 Gs. Purchase your Axator Battle Gear from Amazon now!